Thirty-four registrants and 2 publishers joined the conference—Oxford and Cambridge. Leaving TESL Niagara after serving for 6 years are Phoebe Kang, Suzanne Nicks, and Laura Vilk. Two members-at-large are leaving the committee: Francine Beattie and Jennifer Schinkel. TESL Niagara welcomed 2 new members-at-large, Heather Cordeiro & Paulette Desmorneaux, at the Annual General Membership Meeting. TESL Niagara held its annual Spring Conference on May 7, 2016, at Brock University. Titled A Time for Growth, the conference brought together over 60 attendees for a morning of seminars and networking. After the Conference, the Annual General Meeting was held where retiring Brock Professor, Dr. John Sivell, a long time supporter of TESL Niagara Chapter and Conferences was honoured. In addition, three new Members-at-Large were acclaimed to join the Executive. Four presenters included: Sherry Campbell (mental health in the ESL classroom), Anna Bartosik (LinkedIn and Grammar Activities), and Nataliya Borkovska and Scott Jamieson (self-directed vocabulary learning). On Thursday April 7, 2016, at St. John Centre in St Catharines, TESL Niagara Members recently participated in a computer skills workshop run by Michelle Basile, Computer Teacher at Niagara Catholic District School Board. This was an excellent opportunity to practice using Word and other functions to help manage the creation of PBLA and other documents. Our members overwhelmingly found the workshop useful and informative. On Friday, October 23, 2015, TESL Niagara held Eat, Talk, Learn at Coppola's Ristorante in St Catharines, Ontario featuring York and Ryerson University's Danny Tan with his presentation on pronunciation. On Saturday, May 30, 2015, the TESL Niagara Spring Conference was held at the Niagara-on-the Lake Campus of Niagara College. Presentations by Veena Dwivedi, Brock University Department of Applied Linguisticsand Agnes Kucharska, LINC Instructor and a PBLA Lead Teacher, Immigrant Women's Centre, Hamilton, ON. 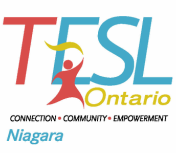 On Friday November 14, 2014, the TESL Niagara Fall Conference was held at the International Centre at Brock University in St Catharines, Ontario. Presentations by Faith Marcel, James Papple, John Sivell, Eldon Friesen, Hedy McGarrell & Donna Pearce, Alex MacGregor & Frank Bieri, Aliye Grant & Kelsey Queen, Pamela Barkwell, and Jackie Angi-Dobbs. On Saturday April 26, 2014, the TESL Niagara Spring Conference was held at St Ann Adult Learning Centre in Niagara Falls, Ontario.